The hard part is finally over – your local Austin movers have successfully moved your possessions into your new home and now you owe it to yourself to kick back and relax. 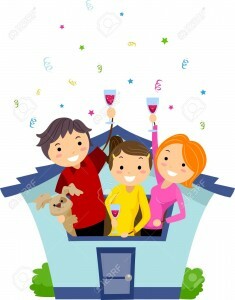 Have some fun while you are relaxing in your new home and start planning your housewarming party! Since moving isn’t cheap and the local movers at BOX OX MOVING COMPANY understand that your budget can be tight, they have compiled a list of tips for throwing a budget friendly housewarming party in your new Austin home. For a cost-friendly party, it goes without saying that less is more. While it may be tempting to invite the whole block in addition to all of your friends and family, try your best to set a reasonable limit on your head count, so that you don’t have to worry about breaking the bank on food and entertainment. When you are ready to send out invites, consider using a cost effective option like e-vite invitations. These free decorative e-vites can be sent through text, email, or even social media. For a more personal touch, try handcrafting your own invites. Don’t forget, you’ve also just recently unpacked your home using a lot of different packing materials including cardboard boxes. Your AUSTIN MOVERS suggest that you put those materials to reuse by decorating the cardboard (for example, wrap the cardboard in solid wrapping paper you can purchase at a local dollar store, and glue your information onto the wrapping paper). The possibilities are endless! Decorations for your housewarming party may seem like a necessity, but keep in mind that your guests are coming to see your home, which is half of the décor on its own. You don’t want to distract your guests with too many bright colored party decorations like streamers, welcome signs, and balloons. Two or three balloons on the mailbox to let your guests know which house is yours should suffice. If you want to go with a theme for your party, keep it simple and purchase themed cups, napkins, and paper plates. This way, any decorations you choose will match, and you can reuse leftover paper products for your next party or for lunches and dinner so that you don’t have to do dishes the first couple weeks after moving to Austin Texas. This will be the most costly. The first option you have is to go potluck and tell your guests to bring a shareable amount of their favorite foods and desserts. If you do this, Austin movers want you to be sure to stock up on chafing pans and chafing fuel to keep everything hot. Stick to lots of small finger foods that you can replenish throughout the party, along with maybe one or two smaller entrées and a few simple desserts. You can also throw your party prior to dinner time, so your guests won’t necessarily expect a full meal. Here are a few ideas to stretch your budget when it comes to light appetizers: chips and salsa, pigs in a blanket, pasta and Rice Salads, or a platter of chicken wings.